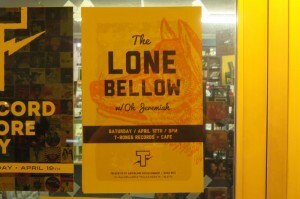 When we first heard that one of the most acclaimed new bands of the last two years, “The Lone Bellow”, was coming to perform at the small T-Bones Records & Cafe in Hattiesburg, MS, we suspected that this could be one of those times that music fans often refer to as: “I was there when……” Most assuredly, this was that kind of show, and one you don’t always have the privilege of attending, especially from a band at this stage of their career. There were so many great music events this same weekend in April that it was nearly impossible to decide which to attend. South Sounds in Mobile, AL; The French Quarter Festival in New Orleans; Willie Sugarcapps’ release of some music from their Fame Studios/Muscle Shoals sessions at an event in Magnolia Springs, AL; The Juke Joint Blues Festival in Clarksdale, MS; and Duling Hall in Jackson, MS…. were just some of what we had to choose from on this particular music filled day. 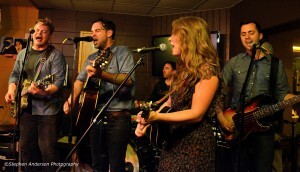 Then there was The Lone Bellow show in the midst of these music events. “The Line” made it’s way to all that was reasonably possible. Artist and contributor to “The Line”, Robby Amonett spent a marathon of hours painting band’s performances, which began on Thursday evening and ran through Sunday at three different events including several shows at South Sounds. 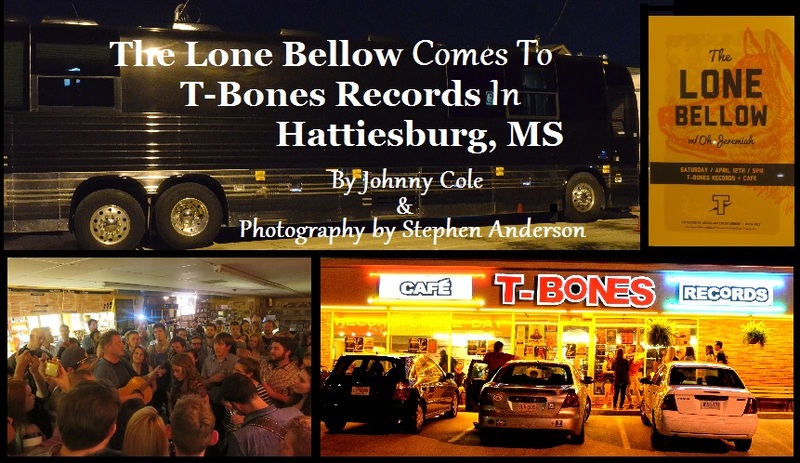 Stephen Anderson and I started Saturday morning at the Willie Sugarcapps show in southern Alabama and then made our way north to Hattiesburg, MS, to the ‘must-see’ show, The Lone Bellow show. 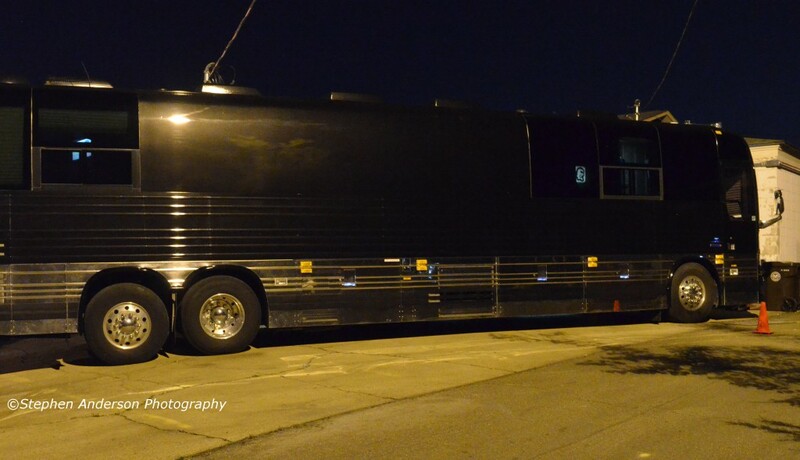 On arriving at T-Bones Records & Cafe, we noticed the huge tour bus parked beside the building located on the north side of Hardy Street. Because we were early, there was only a few people standing in front of the store. As we walked up to the door to inquire about the show, Stephen and I recognized Brian Elmquist from “The Lone Bellow” also in this group. To our enjoyment, we were able to have a nice, lengthy chat with him about the reason for their performing at a smaller venue than what they usually are accustomed to. He not only talked about their excitement in performing for T-Bones’ smaller sized crowd, but also about how this group of Southerners wound up in Brooklyn, New York, something of interest to me as I too have spent time in New York City. 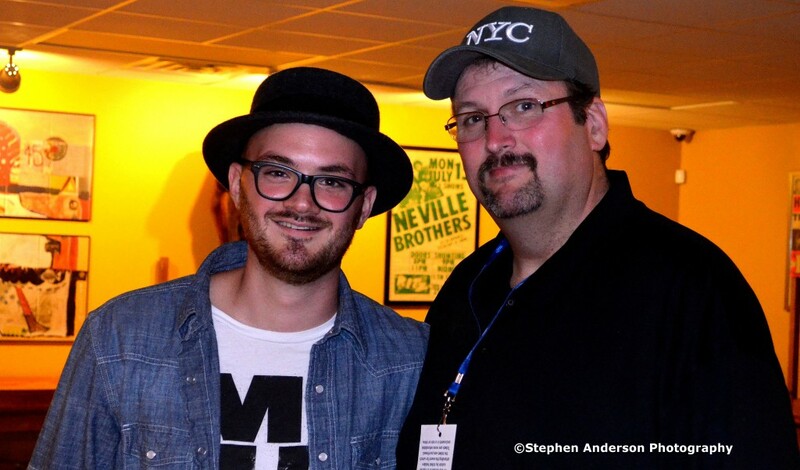 He and singer Zach Williams are originally from Georgia and Kanene Doheney Pipkin is from Virginia. Discussing music venues like New York’s Rockwood Music Hall and various musicians that we both knew, was a lot of fun. Stephen and I appreciated Brian taking the time to talk and admired his enthusiasm for this night’s show and the fun they were expecting. 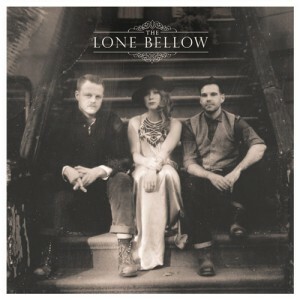 The Lone Bellow’s self-titled” debut album (Descendant Records/A Div. of Sony Music Entertainment) was released in January, 2013 and not long afterward, they garnered quite a notice at 2013′s South By Southwest Festival in Austin, TX. This was when I first became aware of their amazing sound, well written songs and their way of pulling the most out of audiences. Their ability to make an entire room of people a huge part of the show is something that not all bands can easily accomplish,and is rarely seen by someone relatively new without a large body of work familiar to those in attendance. 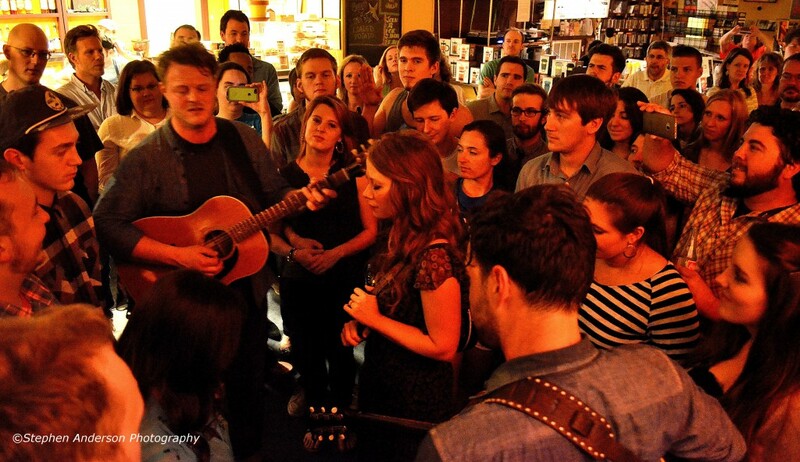 In fact, despite The Lone Bellow’s growing fan base and popularity, there were those in this Hattiesburg crowd that didn’t know exactly who they had come to see. When the band of five musicians entered the tiny (and I repeat, tiny) stage, someone in the audience yelled out, “Is this them?”. A few chuckles occurred, but it was momentary because when The Lone Bellow began to perform, the entire audience became mesmerized, like I have witnessed at concerts by larger artists. The harmonizing and ability to craft a song into a near perfect pitch was something to behold. As the night continued, all in attendance were not only into the show, but were singing along to each song. The Lone Bellow exited the stage on occasion to be in the midst of the audience, even at one time forming a circle to harmonize, surrounded by all those in the room. Moments like that aren’t something you always get to see at a show. This small intimate sized venue, appropriately being a record store, couldn’t have been a better site for such an occurrence. 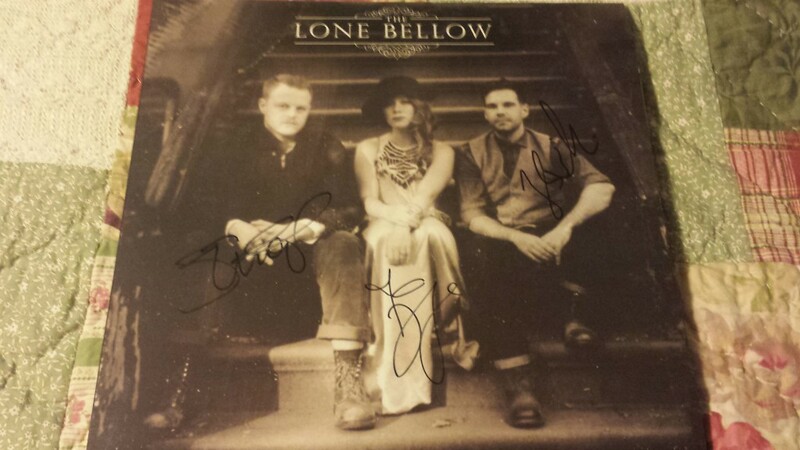 So much can be said of the music of The Lone Bellow. It’s soulful/gospel sound, rich harmonies, blending nicely with a bit of folk and country flare, provide us with something special. Whether called Americana or as they like to say, ‘Brooklyn Country Music”, it all works. Even what they wear on stage is conducive to greatness, from the Woody Guthrie depression era to their late 19th century style that graced the album cover. Countless magazines, newspapers and online sites have described their sound, their album and performances with the highest praise. Since 2013 I have been completely in agreement and having an opportunity to see them at T-Bones is one I won’t soon forget. The artist that opened, Oh Jeremiah, paired nicely with that of the Lone Bellow. Singer/Songwriter Jeremiah Stricklin and Erin Raber were more than excited about this evening. They told the record store crowd that they were in for something amazing later that night. 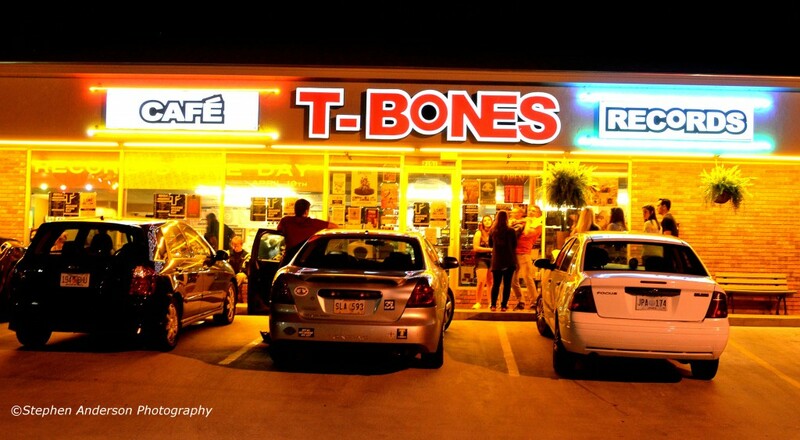 An obvious fan, Jeremiah knew what was in store and he knew this was a ‘fairly big thing’ to happen in T-Bones Records. He and I talked quite a bit about ‘how cool’ the whole thing was and for him to be a part of this night of music. I first saw Oh, Jeremiah some time back at Ben Kaufman’s “Irish Coast Pub” in Gulfport, MS (Ben is also a member of the band, Kaboom). 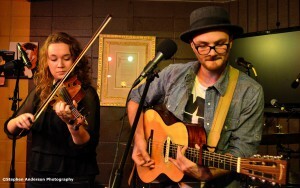 Jeremiah Stricklin told me that the Irish Coast Pub show was only their second live gig. I saw much promise and since then I’ve watched Oh Jeremiah tour the U.S. at some notable venues. The second release from Oh Jeremiah comes out in May and I’m sure it will be as good as the first. I’m looking forward to years of great music ahead from Oh Jeremiah. 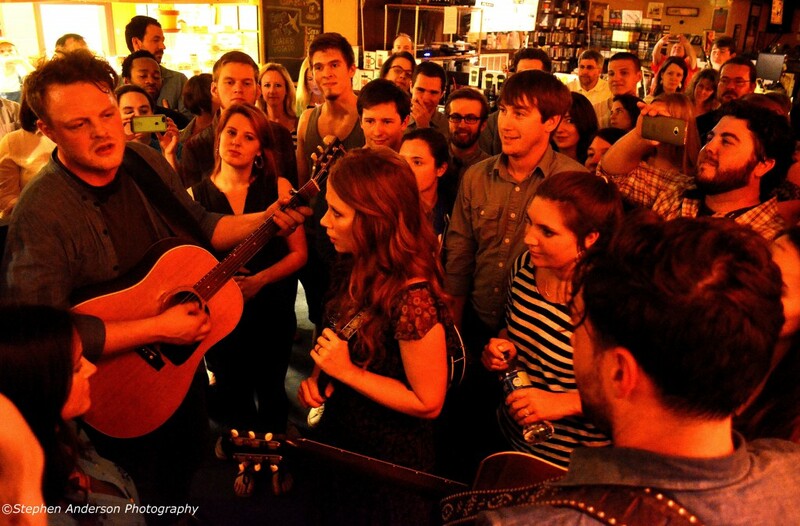 After The Lone Bellow’s Hattiesburg T-Bones Records’ show, those in attendance were busy purchasing merchandise from T-Shirts, CD’s to Vinyl Record Albums. 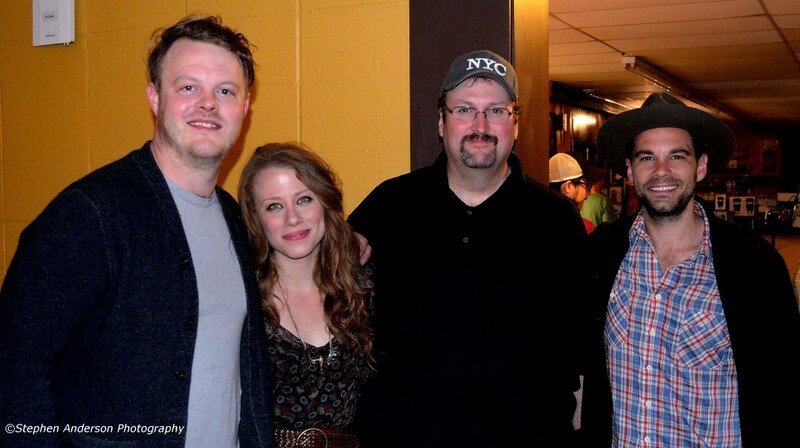 The Lone Bellow returned from their tour bus soon afterward for photos and signatures. They all took plenty of time with each fan regardless of age. Following the show at T-Bones, The Lone Bellow went on to perform at the very nice Duling Hall in Jackson, MS on Sunday. We, at The Southland Music Line, consider ourselves huge fans of this band and encourage others to check them out. The music and live shows rank among the best of the new crop of bands and artists going today, placing them with the likes of The Lumineers, The Civil Wars and a few similar artists. 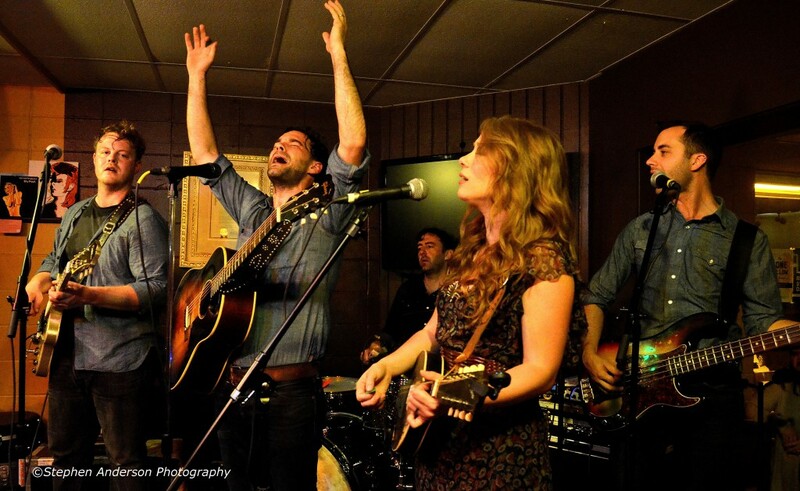 We encourage all to check out the following links and to purchase the music of The Lone Bellow and Oh Jeremiah. Also support local record stores like T-Bones and great music venues like Rockwood Music Hall in New York City. And of course, support your local music scene. Tagged Hattiesburg Mississippi, Oh Jeremiah, Southern Music Scene, Southern Music Venues, T-Bones Records, The Lone Bellow. I am the GM of WUSM, the university’s radio station, in Hattiesburg. I can’t say enough great things about Oh, Jeremiah. And after seeing Lone Bellow live, I can’t say enough great things about them, either. If the crowd buys into the band, the “leader” of said band can do no wrong. Hattiesburg bought Lone Bellow completely, and Zack ably led the crowd like an evangelist – tender, honest, but completely. Great crowd engagement and interplay. We played the record, but sometimes you can’t tell what resonates with people – what I have come to understand after 30+ years in radio is that great music resonates, regardless of genre – it is about the soul. 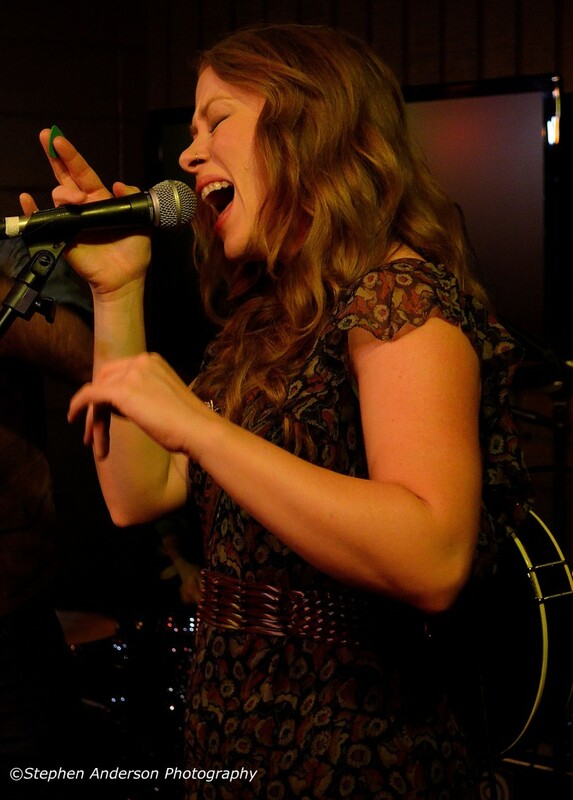 The Lone Bellow performance was way up there in terms of soul – bravo. We appreciate the comments. Everything you said was totally right too! 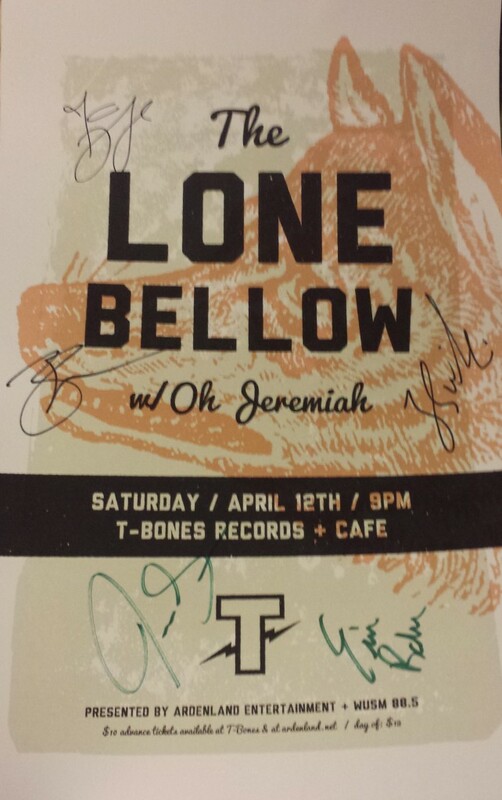 …..I am so impressed with The Lone Bellow. That show was one of the best I’ve seen in recent months and I attend several each week. I knew they were something special since SXSW ’13 and how true its turning out to be. 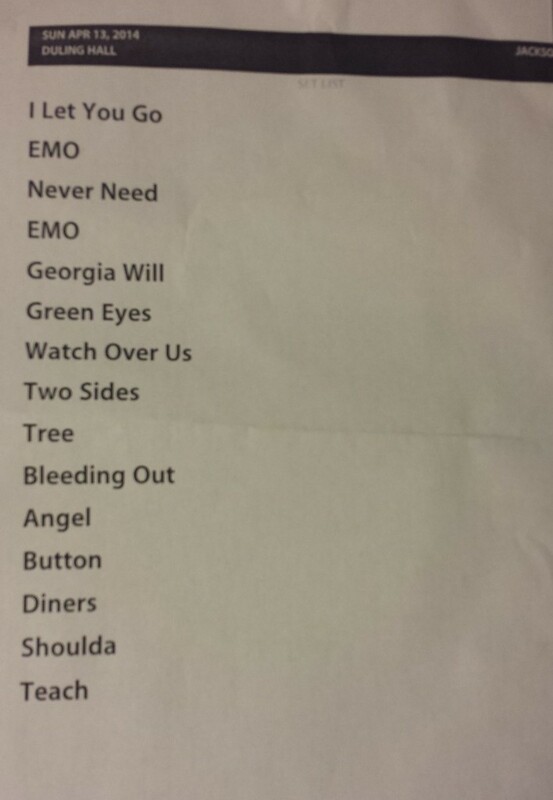 Also I remember seeing Oh Jeremiah on what was their second show (it was in Gulfport, MS according to Jeremiah). In just a short time Oh Jeremiah has made such remarkable progress. I am totally into the music and the live shows. 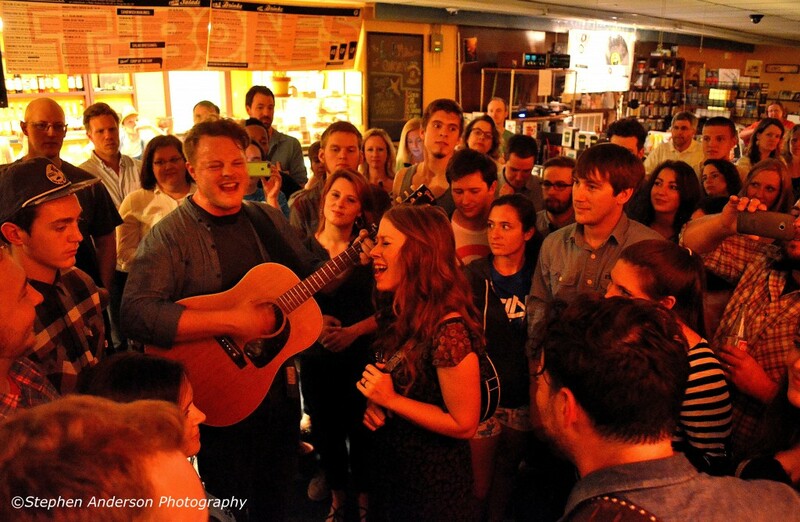 I can’t wait to see whats next for Oh Jeremiah and The Lone Bellow. I want to see The Lone Bellow now! Nailed it with this group, Johnny! Awesome sound! Listened to them on the commute today and can’t get enough. Hope they come back south.